Keith was introduced to another aspect of Jim Henson and George Lucas today. 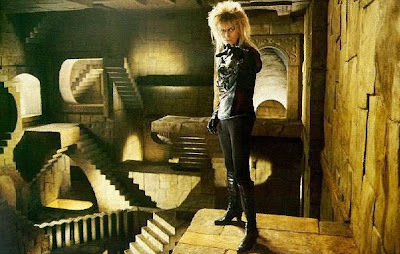 We watched Labyrinth. David Bowie in makeup, a plunging neckline and skin tight pants... oh 80's, where have you gone? "Just let me rule you and you can have everything that you want." "Just fear me, love me, do as I say and I will be your slave." Can love be any simpler than that? I have to say that the 80's were not my best look. I much prefer the 21st century and whoever invented the japanese hair straightener!! Oooh, help me out since you just watched an 80's movie. I'm going to a costume party on saturday and we're supposed to dress in 80's style--I only remember big hair--what else Amy? I LOVE that movie! My dad used to rent it all the time when we were little. It still freaks me out a little, but it's great. That's one of my favorite movies! A while ago I was trying to figure out if Bowie was supposed to resemble the devil or some possessed being. I never figured that one out. I haven't watched that movie in forever! I used to love it when I was little. Scarily enough all of those 80's fashions are coming back into style again. I just saw green plaid stir-up pants at Kohl's the other day. I love Jennifer Connelly but that movie always seemed creepy to me. Like a nightmare!